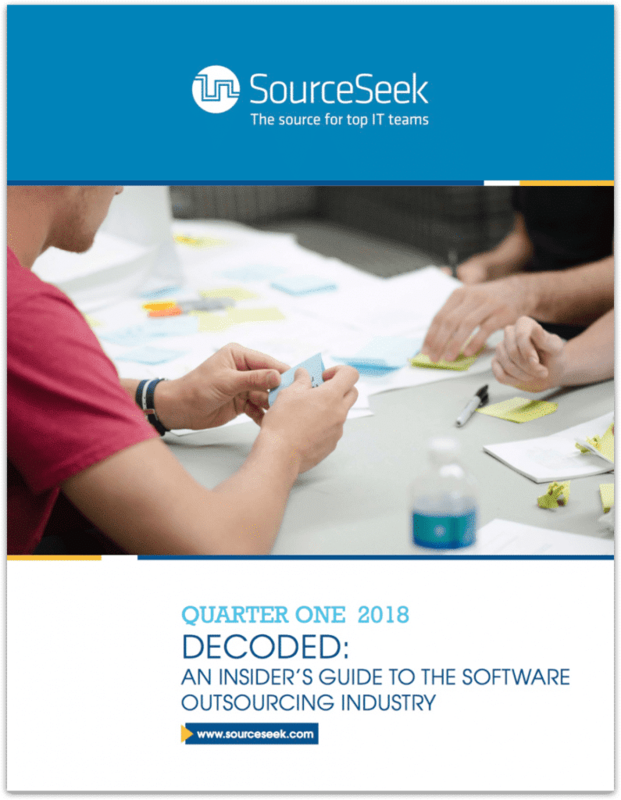 SourceSeek is pleased to release the latest edition of Decoded: An Insider’s Guide to the Software Outsourcing Industry. This report leverages information from SourceSeek’s ever-expanding network of experienced offshore development teams to understand industry trends, and help inform offshore clients and vendors alike. As you’ll see below, the offshore software industry, much like the rest of the tech world, moves very rapidly. It is our hope that this report helps keep you up to date, and ahead of the curve. Since 2013, SourceSeek has been matching companies with vetted, hand-selected offshore development teams. Having built a database of thousands of software development teams across the globe, SourceSeek is uniquely positioned to collect, analyze, and publish data on the software outsourcing industry. This edition of the survey includes 900 responses collected between April 2017 and March 2018 from partners in over 70 countries. This report features detailed insights into team dynamics and size, technological trends, client-vendor relationships, and pricing. Average hourly prices across the software outsourcing industry is $32.33, up from $31.25 last quarter. From a technical perspective, PHP remains the dominant specialty reported by responding teams. In all, 19% of all teams claim PHP as an expertise. This glut of supply is likely fueled by WordPress providers, and suppresses the rise in hourly rates seen with other programming languages. Hourly rates for PHP remain relatively inexpensive, at $31.58/hour, almost a full dollar per hour lower than the average hourly rate across all specialties. Teams are increasingly offering Security services, as the industry saw a large quarterly jump in supply. The percentage of teams claiming the expertise jumped from 1.5% to 1.9%, a change of 26%. Increasing supply, however, is not keeping pace with demand. Thus, hourly rates have skyrocketed from $35.08 to $40.05/hr, a change of 14% in just one quarter. Stay tuned for updates, as we plan to update this guide regularly. If you have any questions, or just want to learn more about offshore software development, contact us anytime.